This is an update to an old recipe which is a favorite in our house especially once the weather starts getting too hot to cook inside or out. It hasn’t got that hot yet though, the weather has been still pleasantly comfortable. Yet whenever I try to think of something light, refreshing and still filling, this recipe comes to mind. My husband does not bother with the lettuce cups or lettuce tacos as he calls it. He dumps the mixture over rice, and he’s good to go. 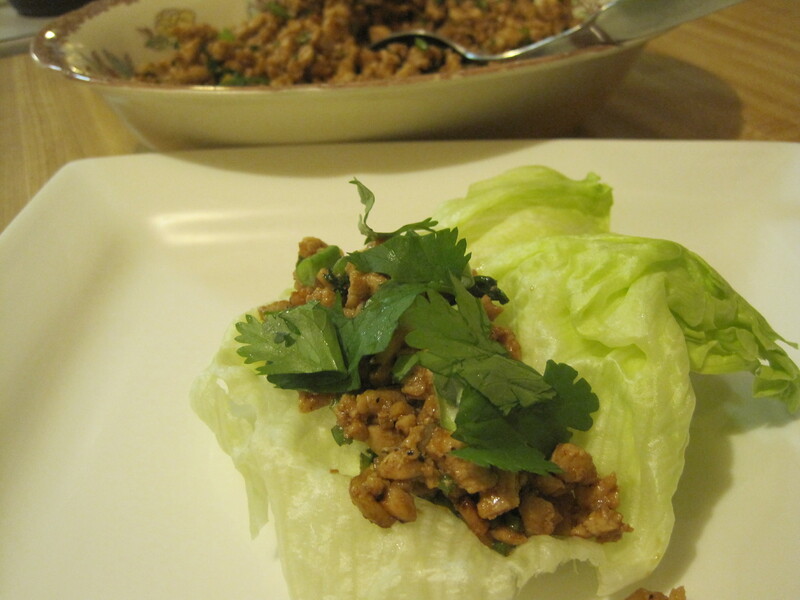 The girls and I like it wrapped in lettuce with extra scallions and cilantro on top with an additional hoisin sauce. Yummy! 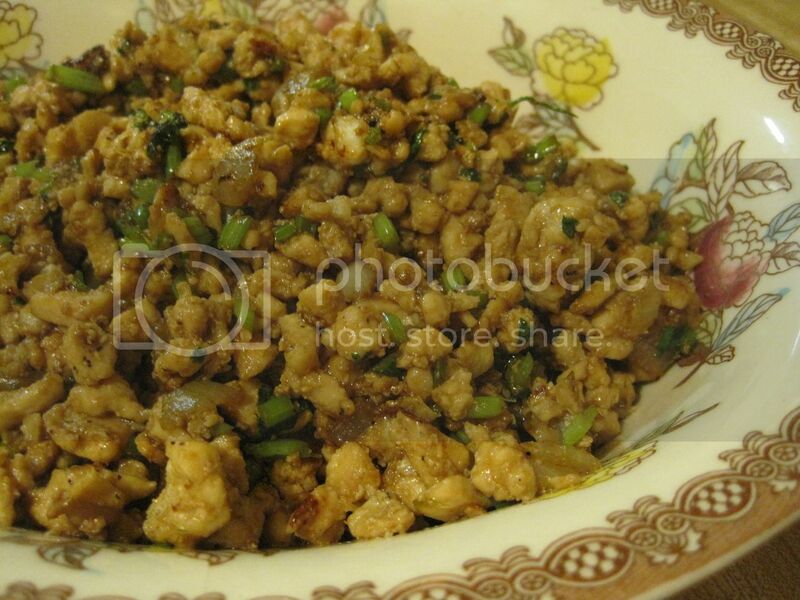 Cooking sauce: Mix together the cornstarch, dry sherry, oyster sauce, and water in a small bowl. Set aside. In a wok or large pan, heat oil and saute’ the chicken until opaque and set aside. Heat up a bit more oil and saute’ the ginger, garlic and onions until fragrant. Add the dried mushrooms, stir fry for a couple of minutes and add the chicken back in the pan. Add the 'cooking sauce', half of the chopped green onions (reserve the other half for adding on top of each lettuce cup) and stir. 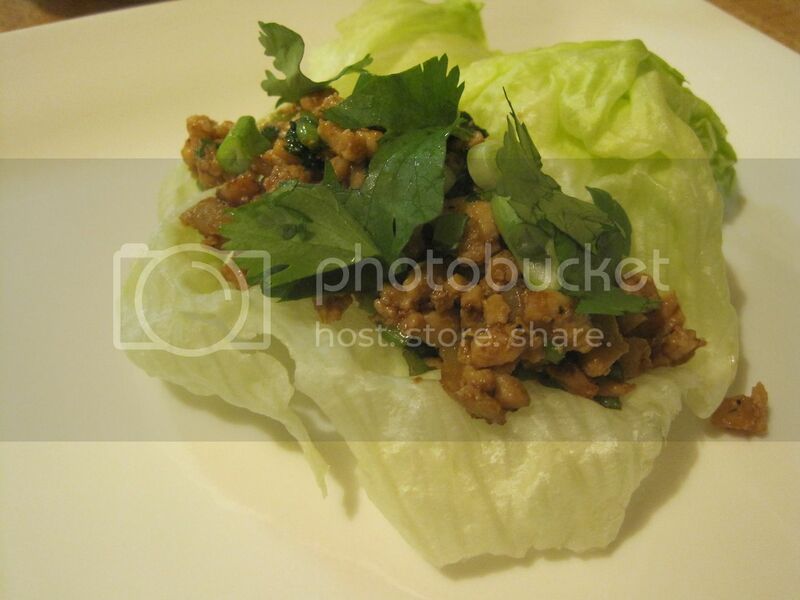 To serve, spread a little Hoisin sauce on a lettuce leaf, add a spoonful of the chicken, and sprinkle with green onions and Cilantro. Wrap up in the lettuce, and enjoy! ADDITIONAL NOTES: Cut up the chicken while still partially frozen and you'll get a finer mince (almost ground). Since I use the frozen, boneless, skinless chicken breasts, I don't thaw them out ahead of time. I set them out for the few minutes that I'm chopping the other ingredients and by the time I'm done with that, the chicken should be a little less rock hard and easier to chop through.